In a pressure cooker, add in most of the above ingredients – Meat, Daal, Garlic, Ginger, Green Chili, Salt & Water. Cook with the weight on high heat, allow it to whistle 1 time and then reduce the flame and cook for 25-30 minutes. Let the mixture cool to room temperature. Add in the Onions and grind well in a blender. Avoid using water. Add in the dry spices – Garam Masala, Coriander Powder, Cumin Powder & Red Chili Powder. Mix well. Add in the egg little at a time and mix. Heat some oil in a shallow skillet. Pour Breadcrumbs into a shallow plate. Roll the kebabs (patties) on the breadcrumbs. 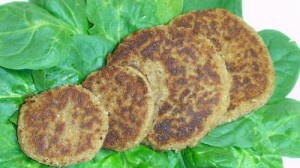 Shallow fry kebabs in oil on both sides till golden-brown. Serve with Imli (Tamarind), Mint or Green Chutney or good old ketchup. 1. If mixture consistency is too watery, add a well-mashed potato or some bread crumbs. 2. Increase the amount of Garam Masala to get a spicier flavor.